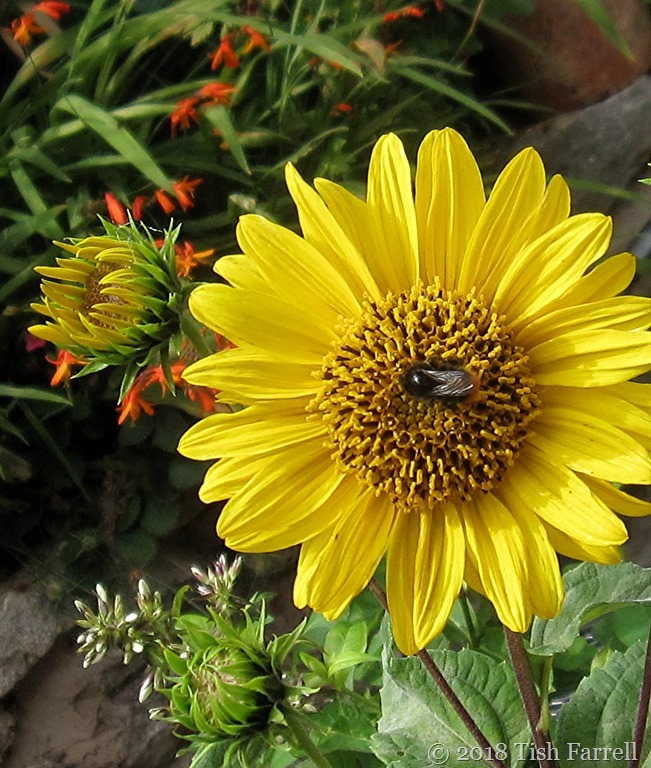 Posted on August 9, 2018 by Tish Farrell	This entry was posted in Bees,, Gardens, Humour and tagged Helianthus Capenoch Star, Much Wenlock, Tish Farrell Writer. Bookmark the permalink. 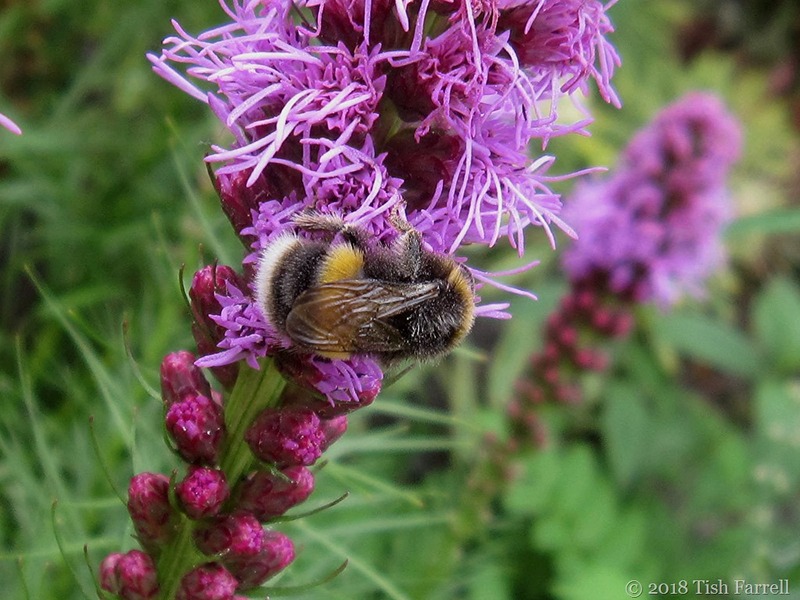 Bee-loud glade – love it Dr. Ian. 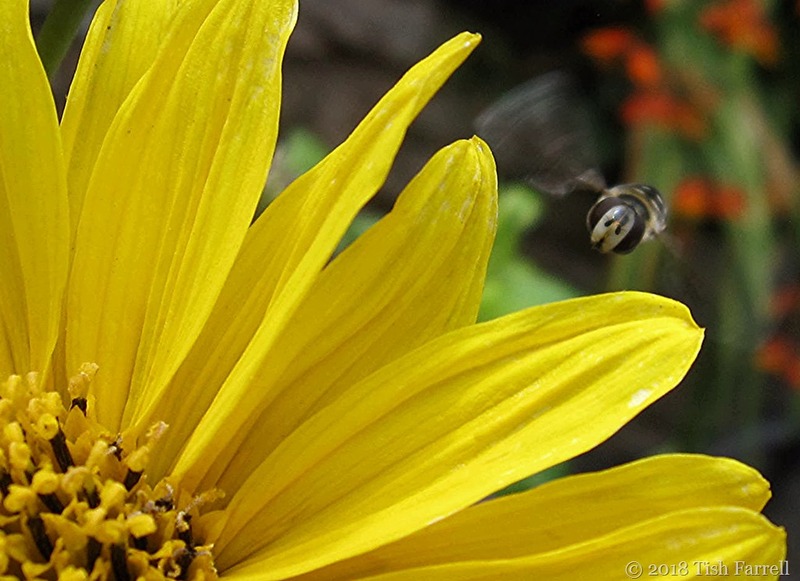 Bet there are a few bee-loud glades in Embu, though of course African bees can be very tetchy. Wow! I am also be-dazzled, Tish. I love those macro bumble bees. Cheers, Peter. They were fun to capture. An expression my late Godmother used to use…. What are you on about ”ditzy”? These are gorgeous shots, especially the second one.
. And the final photo looks like a Migrant Hoverfly – Euopeodes Corrollae. You are a whizz with the hoverfly. I love the determined look on its ‘face’. A bit like an old Lincoln bomber. Weeeeee-eeee. Besides the eyes, if you look at your photo you can just make out the spots on its back. This was the giveaway for me. Many thanks. Jo. And now I’ve started looking, yes those hover flies are all over the show – apparently – as I learn from a Laura link – important stand-ins for honey bee pollinators. So good on them! Up close and personal really matters. They know it is time to “make hay while the sun shines.”. Bees are special and important.. thanks Tish! 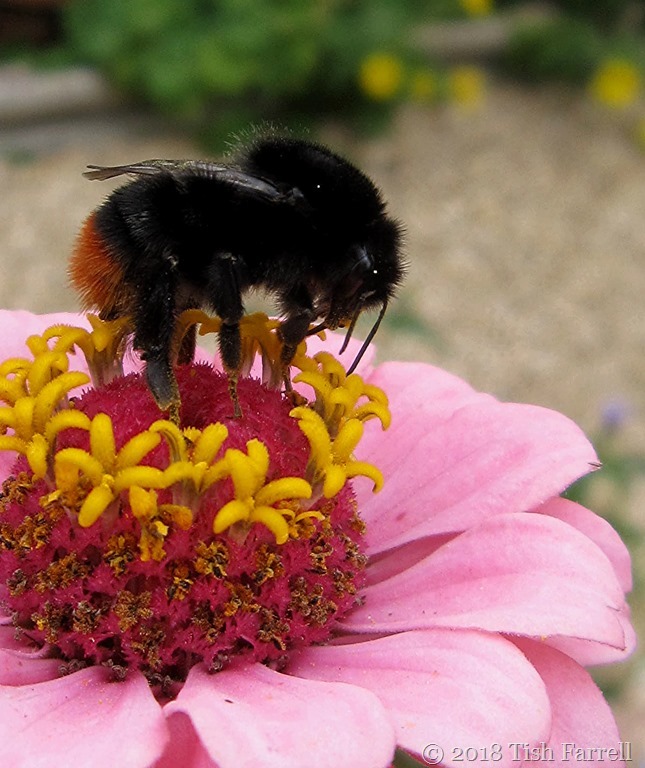 One can easily become susceptible to obsessive compulsive bee watching. Thanks, June. 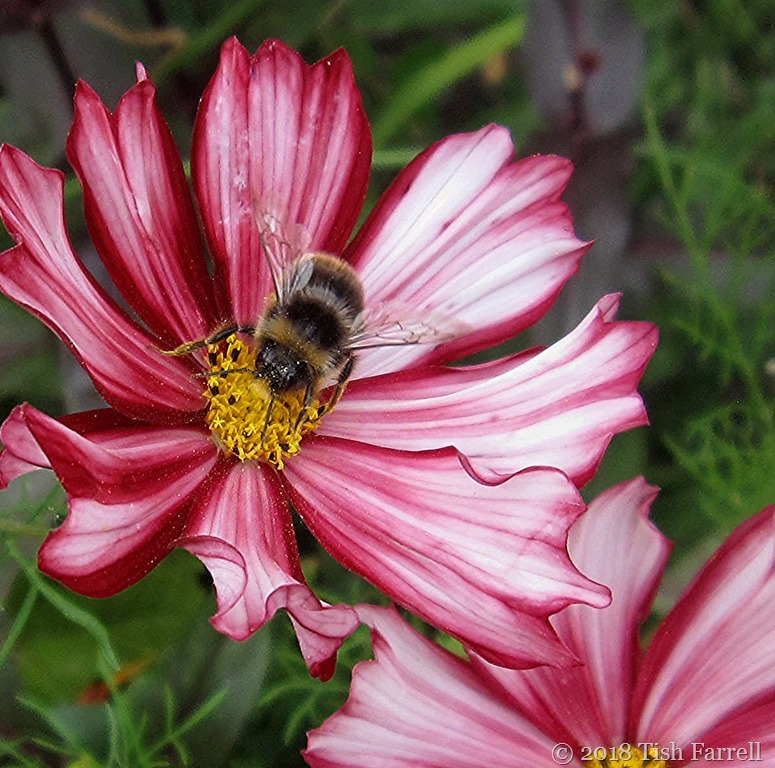 I have just finished writing a post about the bees knees – obviously some sort of telepathy / synchronicity happening here. 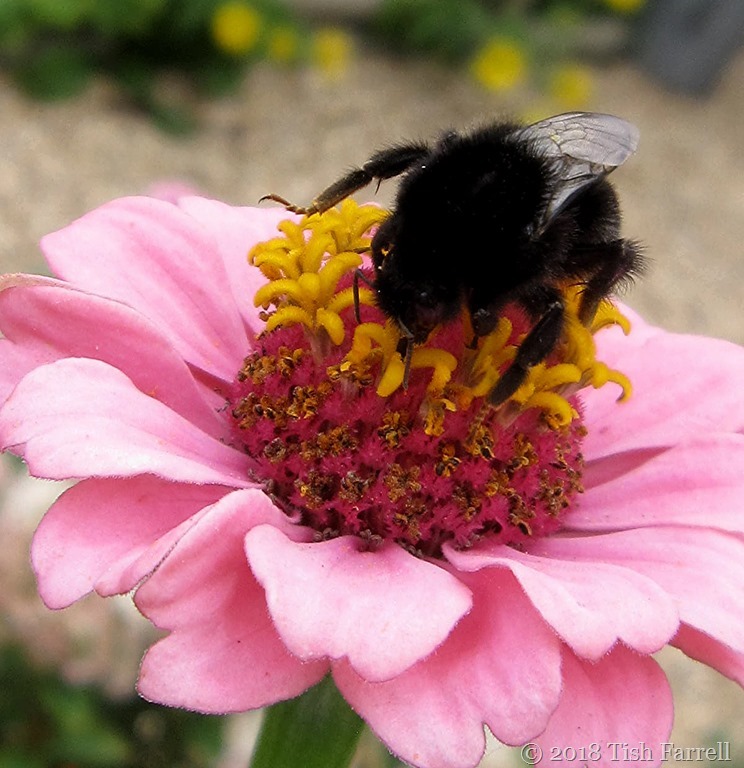 Have you noticed that many of the bees don’t have pollen pockets? Males or cuckoo bees? That’s my question. 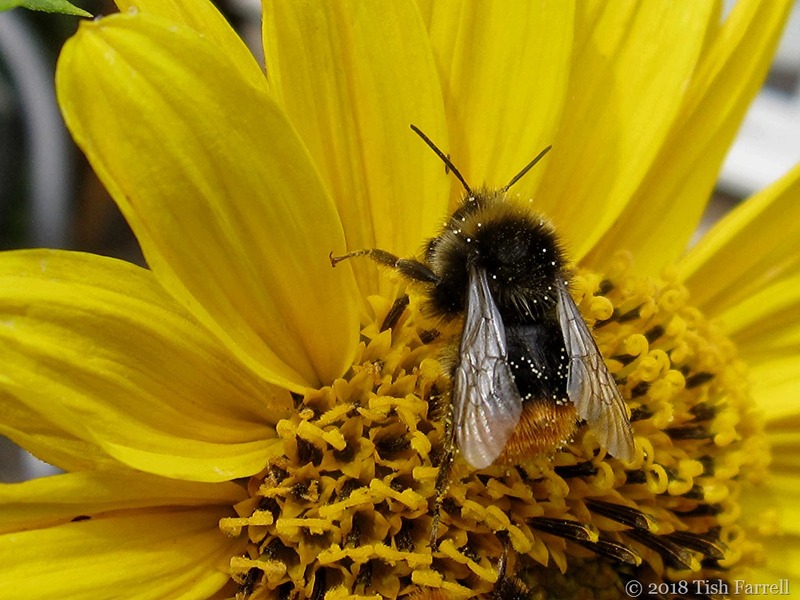 I just scrolled through your recent posts to look for this post as I’ve always been fascinated by the origin of this phrase “the bee’s knees” – the etymology seems to be a little fuzzy as there is a great deal of speculation but not a whole lot of definitives. As I couldn’t find your post, I assume that it is a work in progress and I look forward to seeing it soon! Sorry PP. Will be posted next Friday 🙂 But thanks for visiting. That’s really funny. What is going on in our heads? I also noticed a lack of pollen pockets, though one had pollen all over its face. But then I think the ones I was watching were necking the nectar. I need to find out more about bees. What a fabulous post, Tish! absolutely stunning captures of a riot of colourful flowers and these lovely creatures! I can imagine how mesmerising it was to sit there and watch these little critters! So everyone is clocking to the new kid on the block! Happy to bring you lots of colour, Yvette. These are just marvelous, Tish, especially that second one with the bee standing up!! I also love the title, of course, puns and word play bee-ing something I deer-ly love. 🙂 Enjoy your weekend! Those shots are just stunning, Tish. Lovely to see all those bees. I’ll have to take a look at the Canon Ixus when I can no longer get coal for my Instamatic. Thanks, Mike. Ha! Coal for your Instamatic indeed. It’s an Ixus 870 IS – bought it on Ebay for not very much. Very easy to use with both a macro and digital macro setting. Beautiful photos od the beed inside the flowers.I am not knowledgeable… do you use a special lense? A bit late for me to learn now!! Bee-rilliant 😀 … was that last photo an hoverfly bum-shot or a head-shot? Ha! It does look a bit like a bum shot – but t’was a head shot. Wonderful photos! And I think I just fell in love with your little Canon Ixus! Look at those wings! Fabulous photography.